Last week we got some sunlight and I was in the mood of making something summery. 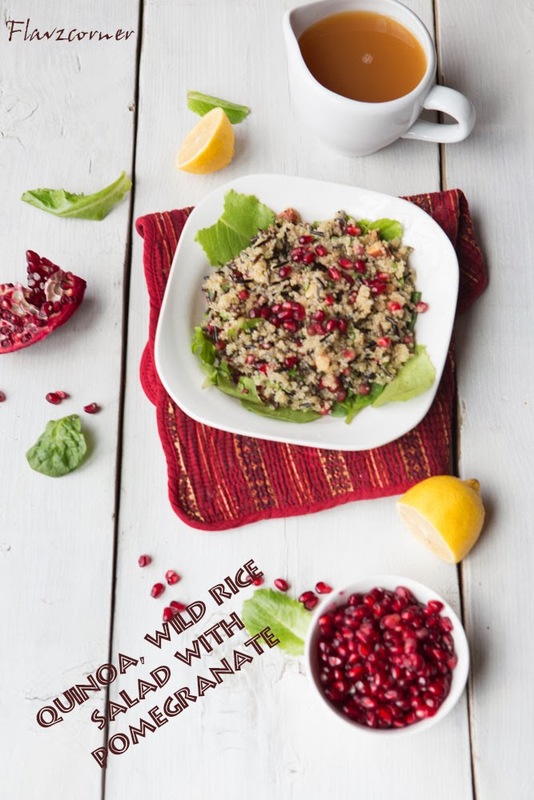 A colorful salad with the beautiful fall fruit pomegranate and lots of protein from Quinoa and fiber from black wild rice with the tangy and sweet apple cider vinaigrette was perfect for the bright day, even though the temperature was pretty low. 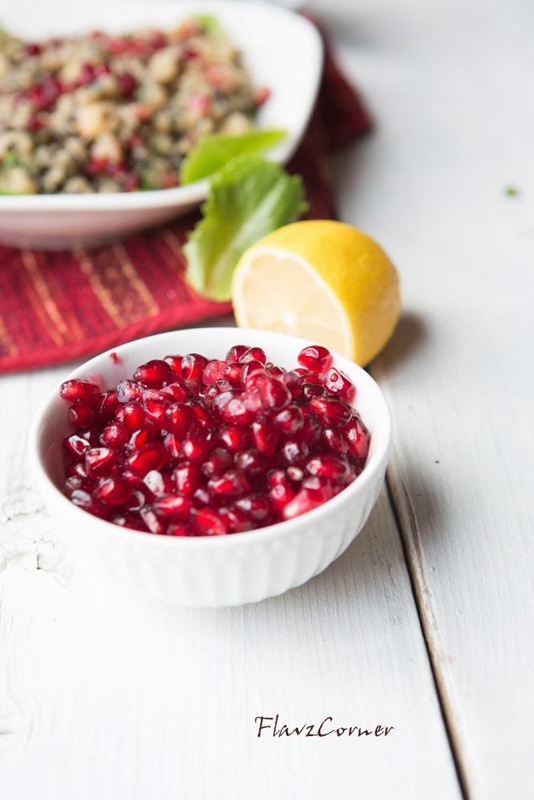 Pomegranates are very low in Saturated Fat, Cholesterol and Sodium. It is also a good source of dietary Fiber, Folate, Vitamin C and Vitamin K. Choose a pomegranate that is heavy for its size. The heavier the pomegranate, the juicier it will be. If you are one among them who likes to stay away from pomegranate due to the trouble in separating the seeds out, you are missing a lot. Here are the step by step instructions on how to separate the seeds easily. Use an apron or wear old cloth when handling pomegranate, as they tend to stain clothes. With a sharp knife cut 1/2 inch from the crown off. Cut into 4 sections through the membranes. Take a medium size bowl with cold water and try to push out and separate the seeds into the water. Seeds will settle down in the bottom and the membrane will float in the water. Skim the membrane from the top and use a strainer to collect the seeds. As Pomegranates are available during this season, I make use of these beautiful fruit in salads or serve as a after school snacks for kids. Kids love to munch on these Ruby Red 'Crystals', that's what they call it. My daughter loves to separate the seeds of the pomegranate without any mess. Of course she likes to play in the water while she opens a pomegranate. Take a small glass bottle with lid and shake all ingredients for dressing until well-blended. Toss the spring mix with little bit of salad dressing and arrange on the salad bowl. 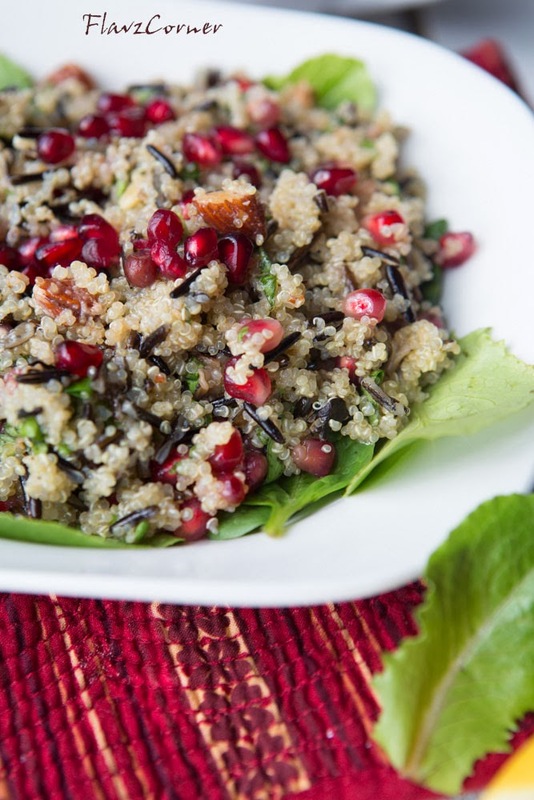 Mix the quinoa, wild rice, chopped spring mix and pomegranate with the salad dressing and place on the spring mix layer. Add the toasted pecans and almonds before serving and enjoy. The salad does look summery, Shibi. And full of flavor! I always buy pomegranates at this time of the year, but don't have that many recipes for them. You just gave me a delish looking new one! Good stuff - thanks. loved the closeup click and of course, sucha helathy platter too. Hadn't been to blogsphere for some time. Hope you doing great. latest post on Quick Picks blog - Snake Gourd Scrambled Egg Burji. Dont you just love the pomegranate season? I love your salad, it has all my favorite ingredients in it! That's looking very colourful...I should say u r very innovative in cooking !! That's a nice tip to separate the fruit, I always give it a whack on back and it rains...not easy though, will try ur way next time .